BBC NEWS | UK | Education | Did the Rose review prune enough? Did the Rose review prune enough? On the day the final Rose report on the primary curriculum was published this week, I was in the sort of classroom that traditionalists dream about. The children were sitting in rows, facing the front. They chanted times tables, were drilled in rote learning, were forbidden from writing with their left hands, and were even threatened with the cane. It made a sharp contrast to the Rose review's recommendations of a primary curriculum structured around six "areas of learning", with information and communication technology (ICT) and spoken communication placed at the heart of the new national curriculum. Large parts of the media and the Conservatives' schools spokesman, Nick Gibb - who are unhappy with the Rose review - would probably have approved of much that was going on. There was iron discipline, subjects were taught separately, and neat handwriting, good spelling and accurate counting were required. And, no, this classroom was not somewhere in south-east Asia, where countries like Singapore and Korea achieve good results in the basics through traditional, whole-class teaching and a sharp focus on numeracy and literacy. No, this was a classroom, with ordinary primary age children, in England. But it was no ordinary lesson. The children were getting a very authentic taste of the Victorian schoolroom at Braintree District Museum in Essex (you can hear more in a BBC Radio 4 series on the history of primary schooling in the autumn). It was interesting to watch the children's reaction to this journey back in time. They were taken aback by the tough discipline. Some were clearly even a little scared. However, all paid attention, sat up straight, and concentrated like mad. In approaching the Rose review many commentators are influenced by a nostalgic vision of the past when children could spell, knew their geography, and were quiet and biddable. And, while there is certainly some merit in the respect and good behaviour produced by the traditional approach - and real value in learning certain things by heart - you only have to see it in action, as I did, to know it is not sufficient for the present day. As the Rose review says, children today need not only to learn what to study but also how to study. In the current debate over the primary curriculum, it is worth noting that Singapore, regularly ranked first or second in the world for school standards, has just announced major reform of its primary schools to encourage a greater focus on skills and values, not just on learning factual knowledge, and to foster more creative learning and innovative thinking among pupils. In this week's report, Sir Jim Rose has conducted a balancing act. He emphasises both knowledge and skills. He advocates both single subject teaching and cross-curricular studies. He wants the priority to be numeracy and literacy but also wants primary schooling to be about moral, social, cultural and physical development. There have been some minor adjustments since his interim report to try to avoid the earlier impression that he was abandoning traditional subjects. Thus, "human, social and environmental understanding" has been renamed as "historical, geographical and social understanding". However, while Sir Jim has aimed for balance and common sense, there is one serious omission from his report: there is nothing about assessment, and specifically about the national tests at age 11, which dominate the final year or two of primary school. 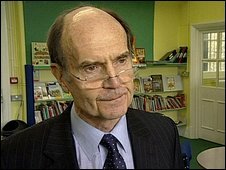 Sir Jim was warned off this area by the Schools Secretary, Ed Balls, who has handed that responsibility to the expert group on assessment, as it is known, which will report shortly. However, separating reviews of curriculum and assessment is a very odd thing to do, as they are completely interdependent. The other concern is whether Sir Jim has done enough to meet one of his own aims, namely reducing the content of the overloaded curriculum. In terms of subjects to be studied, he seems to have done more adding than taking away. Thus ICT has been added to numeracy and literacy as "the core" of the curriculum. He wants spoken communication to be "developed intensively", while insisting that "personal development" is another "essential area". And, of course, he has agreed that foreign languages should become compulsory from age seven. By sticking with traditional subjects, like history and geography, he has not given himself much room for manoeuvre to reduce the range of compulsory subjects. We must wait to see whether the final programmes of study will actually reduce the legally prescribed content for each subject. But it seems the national curriculum continues to be the repository of a very wide range of subjects and of every worthwhile activity from cookery to citizenship. It seems the politicians and the experts are not ready to set a very simple primary national curriculum, with a compulsory core of little more than maths and English, while leaving the rest to teachers' discretion. Sir Jim's trimming axe may not prove to be big enough.